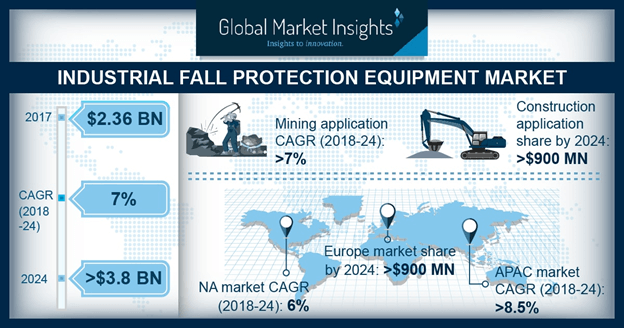 Industrial Fall Protection Equipment Market size is set to surpass USD 3.8 billion by 2024; according to a new research report by Global Market Insights, Inc. Rising focus on workers safety during construction, mining, energy and oil & gas industries are escalating global fall protection equipment market demand. It involves use of controls which are preferably designed to protect personnel from falling preventing deaths and injuries. Mishaps and occupational hazards including falling off the overhead platforms, or elevated work stations are factors giving rise for protection measures from various industries may foster industry growth demand. Body belts for industrial fall protection equipment market size may surpass consumption at 50 million units by 2024. These are mainly used in conjunction with full body harness to provide protection against injuries. OSHA also recommends usage of body belts during falling from elevated truck platforms. Germany fall protection equipment market size was valued at over 105 million in 2017. Increasing renewable energy industry demand has led to rise in product usages such as harnesses and netting may favor market growth in the region. The safety standards in Germany follow the directives of the European Union and are developed locally by the Joint German Occupational Safety & Health Strategy. Factors hindering industrial fall protection equipment market are selling of low quality and inexpensive products with nonexistence of product demand in the U.S., China, and Germany. Although, contractors or manufacturers choose to supersede requirements for fall protection to protect their workers and implement safety standards. U.S. hard goods for industrial fall protection equipment market size is poised to exceed USD 7 million over the forecast timeframe. These include mainly anchors, retractable blocks, and carabiners. Anchors are installed in the roof and connected to lanyards which prevents workers from falling. Strict mandates regulated by the government to maintain standards at workshop to avoid hazards and injuries which in turn boost regional demand. China industrial fall protection equipment industry demand from oil & gas applications may show substantial growth at around 9% up to 2024. These are widely designed to help employees to work efficiently and durable to withstand corrosive materials, grime, and grease within the oil & gas sector. Companies offers lanyards, harnesses, ladder safety, netting, carabiners, and rescue systems designed for the industry. MSA Safety Company, 3M, Honeywell Miller, SKYLOTEC, and Capital Safety are key industrial players in industrial fall protection equipment market. Companies are focusing on offering complete product portfolio as per standards listed by authorities to meet required comfort and protection will stimulate fall protection equipment market growth. Also, companies offer various benefits such as ease of application, high reliability, and innovative features and are sold through company’s website.